A leaf blower can be one of the most useful tools for cleaning up your yard and other outdoor areas. However, many people see even the best leaf blowers as somewhat one-dimensional. While they are obviously good for removing leaves and other debris from the yard, people hesitate to invest money in an electric or battery powered leaf blower because they think that it’s just going to sit in the shed or garage the rest of the year. For those who already own a corded or cordless leaf blower or are considering a purchase, there are many other tasks to which these machines can be applied. This post will look at some surprising ways you can put your leaf blower to work when there are no leaves. This includes cleaning gutters, clearing snow, cleaning your car exterior and interior, clearing out your lawn mower, unclogging your dryer vent, and running wire. If you are looking for the best leaf blower for your home, you need to understand some of the differences between models and consider where and how you may use the machine. Some people will tell you that gas-powered models are the best leaf blowers, but this may not be true for a large portion of DIY-ers. While gas-powered models do tend to have more power, they also require more maintenance. For most homeowners, an electric or battery powered leaf blower will be the better option. They’re easier to use and maintain, and they offer enough power to handle the vast majority of yard upkeep tasks. If you do choose an electric or battery powered model, you have the option to go with a cordless leaf blower or one that is corded. Corded leaf blowers are generally good for any task that is within 100 feet of an outlet. On the other hand, a battery-powered cordless leaf blower will offer more freedom of movement, and the battery packs generally do provide enough runtime to complete the necessary tasks. Besides the power supply, you may also want to consider some of the multi-functional leaf blowers available on the market. 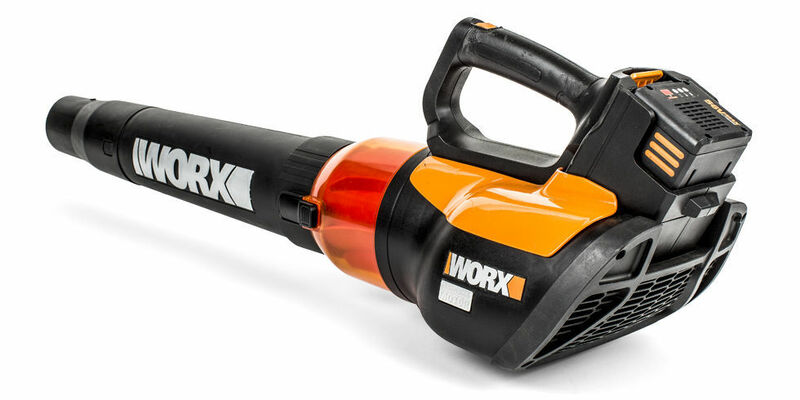 Beyond models that just have the leaf blower function, you also have machines like the Worx Trivac 3-in-1 Blower / Mulcher / Yard Vacuum (WG500.2). In addition to the leaf blowing, these machines may be used to make mulch and as an outdoor vacuum. Even if your corded or cordless leaf blower does not have additional functions like mulching and vacuuming, there are plenty of other ways you can use these machines. For blowing away leaves clogging up your gutters, the 20V AIR Cordless Leaf Blower is perfect for the job. As a battery-powered leaf blower, you don’t have to worry about the cord getting snagged when you are on the ladder, and it’s lightweight and easy to use. You just focus the air into the gutter, and it can remove leaves and debris with little effort. It might be designed for moving leaves, but a corded leaf blower like the TURBINE 450 Electric Leaf Blower can also work well for moving snow. As long as you are working with light, powdery snow, a leaf blower can get the job done faster. It could also save you from all of the back pain and strain that comes with shoveling snow. Leaving water to dry on your car can result in a spotty finish after a car wash, and it can also attract more dirt. If you want to resolve this problem, you can use your leaf blower to dry your car. It will get your car dry quickly, and leave a better-looking finish after it’s washed. This is a task that can be performed well with both an electric or battery powered leaf blower. All sorts of cut grass and other material can build up in your lawnmower over time. Instead of reaching under the machine to clean it out by hand, you can do the work in a fraction of the time if you have a good leaf blower. Clogged dryer vents not only reduce the efficiency of the machine, but they can also be a fire hazard. If you want to clear your dryer vent without having to buy any specialized tools, you could use your cordless or corded leaf blower to get the job done. Just disconnect the vent from the dryer and focus the air from the leaf blower down the vent. A cordless leaf blower can also be a handy tool for cleaning out the interior of your car. Just open the doors and windows and blast air into the interior. The battery powered leaf blower can help to get most of the dust out of the interior, and it could even remove dirt and debris from some of the harder to reach areas. This is an unconventional use for a corded or cordless leaf blower, but if you ever find that you need to run wire through a long stretch of conduit, it could make the job easier. Just attach the end of the wire to a piece of foam or cork, place it in the end of the conduit, and use the air from the leaf blower to move the wire to the other end.